Luxury and flexible accommodation in the heart of town. Sleeps 4-8+ in supreme comfort. Hopefully a few helpful pointers below. 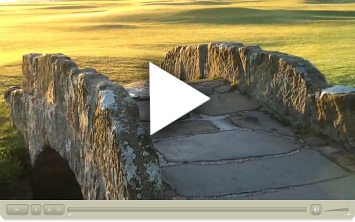 General booking information is found on the St Andrews Links website. Advance tee time bookings on the Old Course - guidelines for 2013. Applications for tee times for all courses in 2014 will likely be accepted from 10:00 BST on Wednesday, 4 September 2013. 2013 3 Day Winter Package with guaranteed Old Course time - we can book this for your group. Check out the latest weather forecast for St Andrews - click below. Click on the image above to take a quick tour of the house and see a little of the town. Question: given the wide choice of accommodation in and around St Andrews, why pick 6 Queen's Gardens? Cost - our rates are highly competitive and especially cost effective for groups of 6-8+. 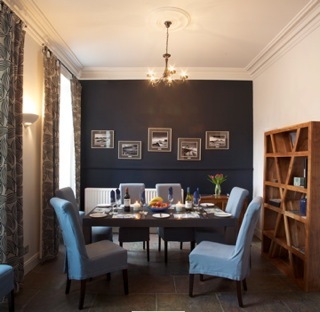 Situated right in the heart of the town, 6 Queen’s Gardens is a wonderful place to spend your time in St Andrews. For golfers we are little more than a couple of minutes drive or a 7-8 minute stroll through town to the iconic setting of the Royal and Ancient clubhouse and the 18th green/1st tee of the Old Course.The beautiful beaches are a similar distance and the university, the castle and cathedral ruins and the shops, bars and restaurants are also all almost on the front doorstep. The house is also ideally positioned for wedding groups with the Town Hall and Holy Trinity Church both within 200 yards of the house. This large Victorian property was fully renovated and restored recently. It is typically set up to sleep 4-8 people in 4 large double/twin bedrooms, 3 with ensuite bath/shower facilities & the 4th with a shower room immediately outside. There are 2 additional beds available for larger groups or children. On the first floor there is a beautiful, spacious drawing room with wireless internet/printer work station; on the ground floor, a second living area and dining area leading into a fully equipped kitchen and opening into rear courtyard. The house has Sky Satellite TV and offers free international phone calls to around 20 countries, including mobiles in North America. There is also a 130 ft south facing private garden with patio seating area & golf practice/warm-up net. Airport and rail transfers and local transport are available by arrangement. If you are travelling under your own steam, you will be met at the house by the managers and will find a 'welcome pack' awaiting your arrival (tea, coffee, sugar, bread, butter, milk, orange juice, jam/marmalade, Scottish shortbread, water, fruit or flowers). From initial booking to arrival and final departure, the owners and locally resident house managers will work with you to tailor-make your stay to exceed your expectations! 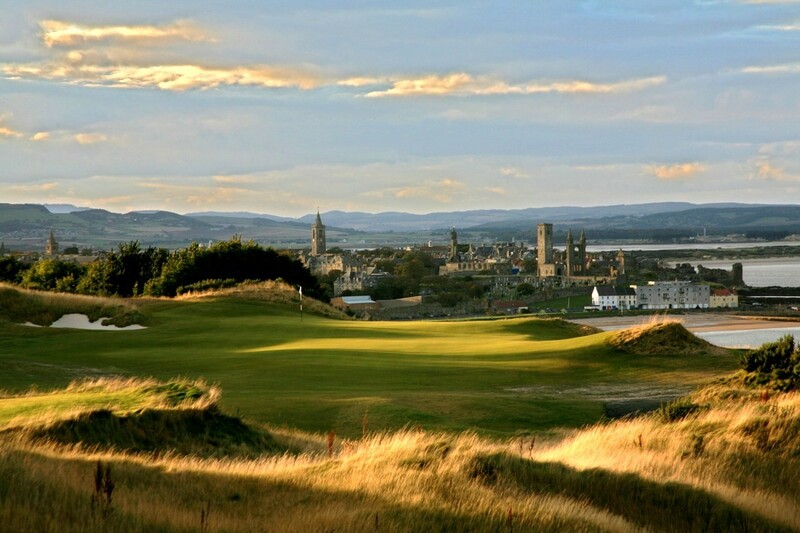 The new Castle Course at St Andrews (opened Summer 2008) provides a stunning alternative view of the town (image courtesy of David J Whyte - see link to his website for more fantastic images & videos of golf courses in the area and across Scotland). The Castle Course was recently ranked #65 in the 2009 Golf Digest Top 100 Courses outside the USA giving the town of St Andrews 4 courses in this Top 100 and prompting the magazine to name the town as the world’s “pre-eminent destination” for golf. The Old Course ranked #2, the New #63 and the Jubilee #92. Kingsbarns pictured below is only 6 miles down the road from St Andrews and was recently ranked #18 in the Top 100 Click here for full list. Carnoustie, about 45 minutes away, was #8. Also within easy reach are Muirfield (#3), North Berwick (#40) and Royal Aberdeen (#48), plus the likes of Gleneagles and Blairgowrie. Welcome to our website - we are constantly striving to enhance the product and would welcome any feedback or suggestions you care to offer. Hopefully it will give you a taste of this luxury 4* accommodation. 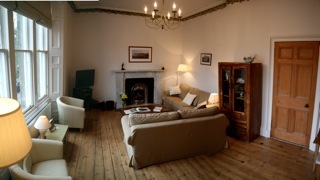 Few people initially consider the option of self catering in St Andrews. 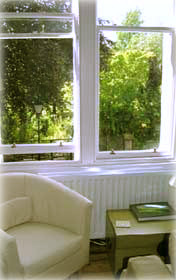 The reality is that 6 Queen's Gardens offers a great alternative to the restrictions of hotels and B&Bs. You can come and go as you please and there is MUCH more space inside and out to enjoy with your friends - rather than having to share with other residents. Despite all this, staying at 6 QG is typically CHEAPER PER HEAD than the alternatives! We are confident you won't find better value anywhere in the town. Golfing legend Mr Arnold Palmer braved the elements at the 2009 R&A Spring Meeting. Pictured below with that year's R&A Captain, Mr Hamish Ritchie. Teeing off the 1st, still drawing big crowds Playing down the 1st fairway... ...and from a bunker on the 5th.